SMS text solutions, Chat - CONTINENT, S.A. Continent Interactive is a multichannel entity that offers converging solutions (SMS, MMS, Voice and Email) to improve the communication experience for our clients at a competitive price. We design and implement integrated solutions aimed at optimizing the market presence and increase digital value. Continent Interactive currently holds a Gateway connection via SMPP and HTTP to the following Mobile Carriers: Cable & Wireless, Movistar, Digicel, Claro and ICE. 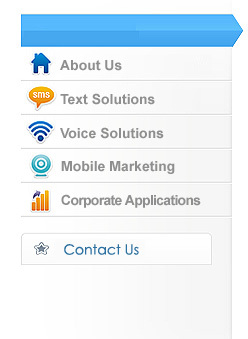 We provide SMS Premium service, also available for white label customization. Animation and Administration for Chat rooms. Alert service for subscription services. Personalized text messages for customer database. Interactive gaming and other solutions (voting, raffles, trivia, coupons, PIN activation, live chat, conferences, polls, up-to-date alerts for news, sports, games and promotions). Content (Wallpapers, games and ringtones) . SMS bulk messaging for corporate use. TV Banners integrated to SMS, social networks, and publicized messages, filtered by predetermined criteria (machine human filter). RSS for received messages to integrate with webpages and other applications.